Korina Sanchez After 'Ruby' Remark: Vacation or Suspension? 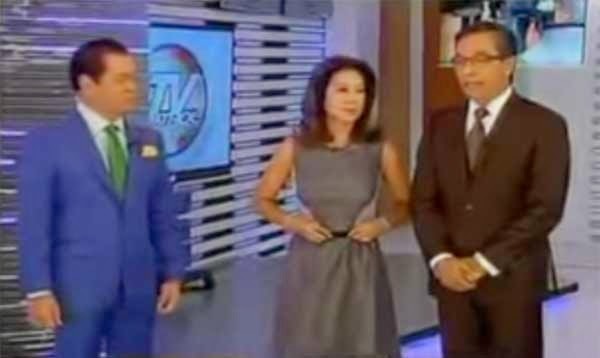 Home / news / video / Korina Sanchez After 'Ruby' Remark: Vacation or Suspension? Korina Sanchez drew flak for hoping the typhoon hits Japan instead of the Philippines. Should she go on vacation or get slapped with suspension? The veteran news anchor made the controversial remark prior to the closing spiels on TV Patrol last December 3. "Kaya pa natin idasal yan para lumihis (We can still pray it changes direction)," said Korina, referring to Typhoon Ruby (Hagupit). "Sana ay hati na lang tayo (Hopefully it will split). Kalahati sa Pilipinas, kalahati sa Japan (Half to the Philippines, half to Japan)," her co-anchor Noli de Castro replied. "Sa kanila na lang lahat (Let them have it all). Parang mas kaya nila (It seems they can handle it better)," Korina said, referring to Japan, one of the first countries that sent aid in the aftermath of Super Typhoon Yolanda. While a few netizens believed that she only expressed a personal opinion with no bad intention, many called her comment "stupid, irresponsible, insensitive, and unethical." Some even wondered why she's still with ABS-CBN following her word war with CNN anchor Andersoon Cooper in 2013 wherein she bashed him on-air for his no-holds-barred reporting of the miserable situation in Tacloban hit hard by Yolanda. In January this year, Korina resigned from her morning program on DZMM. In an official statement, the Kapamilya network said she left her radio show to concentrate on her postgraduate studies at Ateneo. This time, there are speculations that the Rated K host will go on leave from TV Patrol if this new outrage worsens. As a move for "damage control," some people said they think that ABS-CBN will suspend Korina over the latest controversy.